The tensions that are often thought to lie between democracy and constitutionalism are especially pronounced with respect to the entrenchment of economic and social rights. Within current understandings of judicial review, courts appear to lack the competency, and the legitimacy, for economic and social rights adjudication. 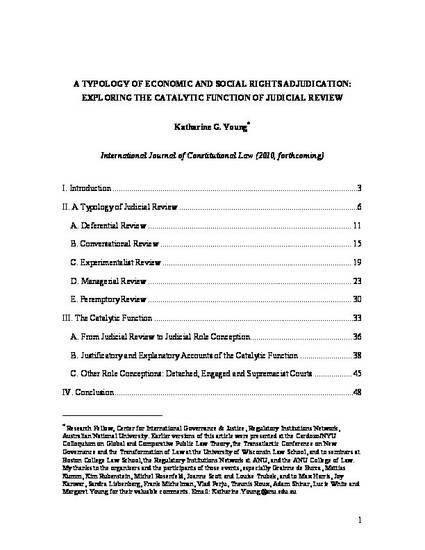 In this article, I draw on the South African Constitutional Court’s experience with justiciable economic and social rights, to present a typology of judicial review, which incorporates deferential, conversational, experimentalist, managerial and peremptory stances. I suggest that these five stances are part of a general judicial role conception which I term catalytic, because it opens up the relationship between courts and the elected branches, and lowers the political energy that is required in order to achieve a rights-protective outcome. Not only is this role conception able to account for a more accurate portrayal of economic and social rights adjudication, I also argue that it is normatively desirable under defined conditions. Finally, I contrast this role conception with others to show that a court’s role in economic and social rights adjudication is dependent upon its perception of itself as an institution of governance, as well as the institutional rules that support that perception.